Aquaport is a waterpark with a ton of fun amenities for people who love to play in the sun and water. It is to reopen this May and will be open every day from 11 A.M. to 7 P.M.
St. Louis, Missouri (May 24, 2018)- Water lovers are able to make a big splash this summer as Aquaport opens for the season on Saturday, May 26th. According to Visitmarylandheights.org, patrons can soak up the sun daily from 11 A.M. to 7 P.M. The pool is great for families because it includes an 8,000 square foot Fun pool with bubblers, sprinklers, and fountains. The next attraction to head for is the 740 ft. Lazy River that lets guests soak up the sun as they move along with the slow current. There are six slides to fly down including a body slide, enclosed flume, tube rapids slide, and racer slides, which is a 50-foot slide that provides visitors the opportunity to race with someone else on the way down. To the bravest visitors, there is the Extreme Bowl, where the visitor slides in a circling funnel until being released into the pool. Aquaport provides everything that visitors need for a day of fun: changing areas, lockers, showers, Top Deck Treats, free parking, and spacious deck areas for sunning and relaxing. Children are invited to play in the Wacky Water play area and the shallow pool area that is for kids under 48 inches tall. Bubblers, sprinklers, and fountains provide an endless day of wet play for the little ones. Older kids can also climb, crawl, and slide in this water play area. There are endless activities for all age groups that can provide an exciting day for everyone who comes to Aquaport. 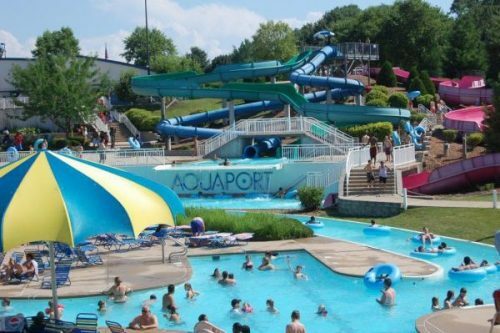 Aquaport is a cool destination for summer fun that is conveniently located one mile from the I-70 and I-270 interchange in the city of Maryland Heights. Camps, groups, birthday party packages and private parties are all available at Aquaport. Discounts are available on special occasions such as Father’s day when all fathers get in free! Aquaport provides everything visitors need to have a relaxing summer day at that the park. For more information please visit http://www.marylandheights.com/departments/parks-and-recreation/facilities/aquaport or visit this Facebook page.